Hello and welcome to Day #1 of Winnie & Walter New Release. There are nine stamp sets, quite a few cutaways released on February 3rd including a free stamp set. 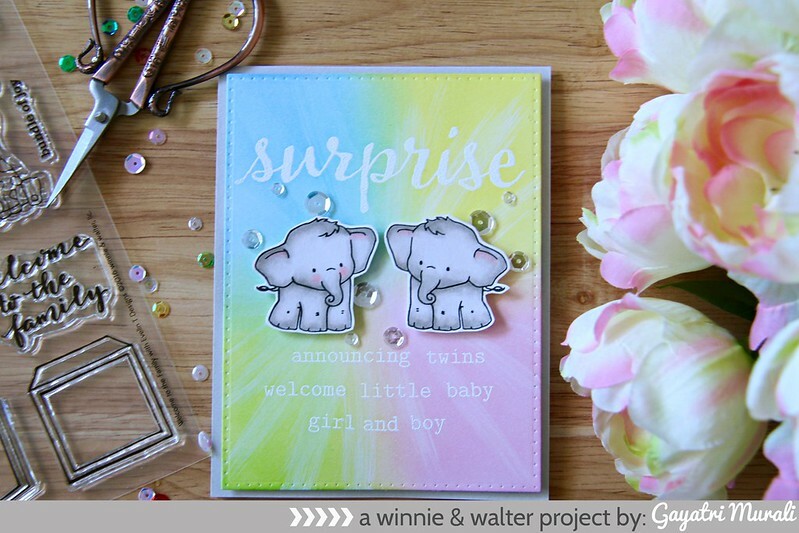 Today I am showcasing a stamp set from Winnie & Walter’s trademark The Big and Bold series called The Big, the Bold and Baby! This stamp set is a big 6×8 inch stamp set and there are dies available for this set separately. I don’t have the dies with me so I have used only the stamp set to make my card. There is a sneak peek of another new stamp set on my card. 1. Fog cardstock is my card base. 2. I die cut a white cardstock using the largest rectangle die from Essentials: Katharine Cutaway. 3. Sponged distress inks Twisted Citron, Spun Sugar, Squeezed Marmalade and Tumbled Glass. 4. Once dry, I used Picket Fence distress paint to make some rays starting from centre of the panel to the edges and let it dry. 5. I stamped the cute elephant images from another new stamp set to be previewed later during the week and copic coloured both the images. I then hand cut them out. There are coordinating dies available for it. I just don’t have them with me yet. 6. The sentiments from The Big, the Bold and Baby stamp set are white heat embossed on the top and bottom of the panel. 7. I adhered the elephants using foam adhesives on the middle of the panel. 8. This panel is adhered on the card base using foam adhesives and embellished using Sparkling Clear sequins. Love the sentiments on the The Big, the Bold and Baby. There are so many sentiment to make baby cards for baby boy, baby girl and twins. And there are images from other new stamp sets which will go well with the stamp set. Thanks for stopping by my blog today. I will see you tomorrow with Day #2 of Winnie & Walter new release. Thats a great card for twins Gayatri, theres not enough of those around. Incredible blending too especially how you made the rays of sunlight! Oh my goodness Gayatri this is a precious card! 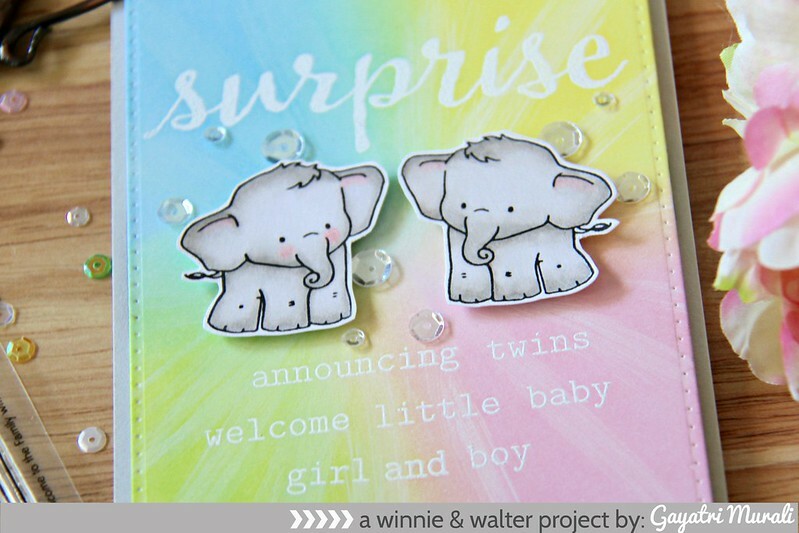 I love those elephants and the colours you've used are amazing! Wonderful set, and your card is utterly adorable!! Pretty collars too!